Origin: Asia. Indochina, Malaysia and Indonesia. 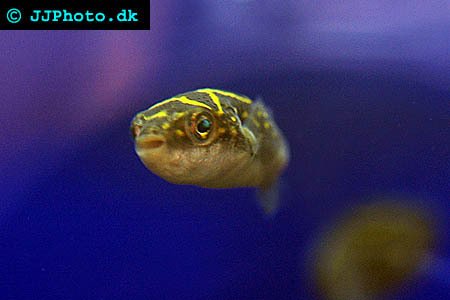 Aquarium setup: Tetraodon biocellatus (Green pufferfish) requires a large aquarium. 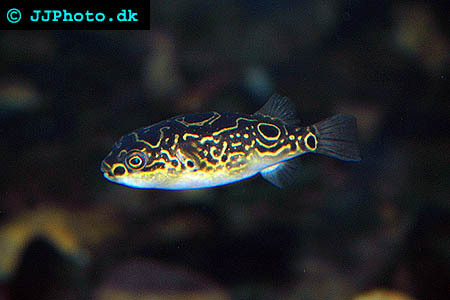 Best kept alone or with other Tetraodon biocellatus (Green pufferfish). If more then one is kept in an aquarium make sure there are a lot of hiding places among plants and rots. The fish should not be able to se each other at all time. Good circulation and regular water changes (up to 50% a week) are required since they are messy eaters. They are sensitive to ammonia and nitrites. Not a brackish water species in contrary to popular belief. Feeding: Very predatory. Best kept on a diet consisting of Krill shrimp, crayfish, crab and the occasional feeder fish. Feeder fish should not be their main food source. Breeding: Have been breed in aquariums.